What does the name Okinawa mean to the average Brit or European? Probably very little except it is something to do with Japan. For an American it was the largest amphibious assault in the Pacific War. The 82-day-long battle lasted from early April until mid-June 1945. Japan lost over 100,000 troops, and the Allies suffered more than 50,000 casualties. It was probably the very high casualty ratio on the taking of the island that persuaded US President Truman that dropping the Atom bomb was the lesser of two evils and would bring the Second World War to a quick conclusion. It did. 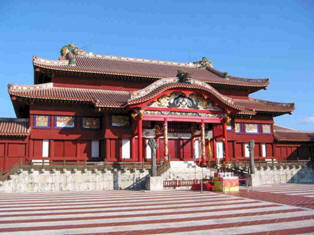 When visiting Okinawa one should first of all consider the geographical and historical implications. 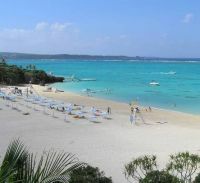 Okinawa itself, the capital of the Ryukyu Archipelago, is about 1,000 miles south of Tokyo and more or less equidistance to the Japanese mainland, China and Taiwan. It was once a kingdom of its own, very much under the influence of China until the early 17th century when it became virtually a Japanese colony, officially a prefecture since 1868. Ryukyu encompasses about 100 islands spread over 600 miles north to south. The historical dialect of Ryukyu is difficult to understand by natives of the main Japanese island. It is its favourable location, in the centre of the sea routes that has made Okinawa a prosperous and much fought over territory, its history very much for us to see today. Okinawa is the birthplace of karate. One of the world’s most popular martial arts, karate is the fusion of Chinese kung fu and traditional island codified hand to hand combat. Given its turbulent history, Okinawa has evolved into a unique melting pot of cultures — a mix of Ryukyuan, Chinese and Japanese traditions permeated by American pop culture from the US's long military presence on the island. For visitors to Japan it is culturally and weather-wise completely different. Okinawa experiences temperatures above 20°C (68°F) for most of the year, very sub-tropical and never that hot. The many islands that make up the prefecture contains some of the most abundant coral reefs found in the world. There are frequent air services to the major Japanese cities, to Hong Kong, Shanghai and Taiwan. A monorail, the only train on any of the islands, runs from the international airport, through the heart of Naha (the downtown and dock area) to Shuri Castle. There are 15 stops and the line is just seven miles long. If you are coming in by cruise ship it will probably dock at what is known as the Seaside Road. No massive terminal, it is straight on and off with a welcoming band. Kokusai Street in the heart of the city, with its shops and entertainment within walking distance. Grab a map from the tourist board people. Go via the Fukushuen Chinese Garden built in 1992 by Fuzhou City using genuine materials from Fuzhou and with techniques unique to that city. Also fascinating is the pottery production with a small collection of shops and tiny factories grouped together in an area called Tsuboya. Whilst the Japanese are very friendly, speaking English is not one of their stronger points (unlike the Chinese who are quite good). Either get someone to write down your destination or point it out on a map. With 40,000 American troops based (controversially) on the island the language problems are less than say in Kyoto. 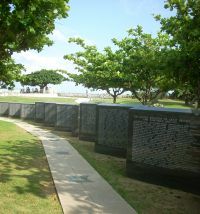 The International Cemetery of Tomari and the Peace Memorial Park are two cemeteries which have to be a MUST when visiting Okinawa. The former is within the city limits sited near the seafront. 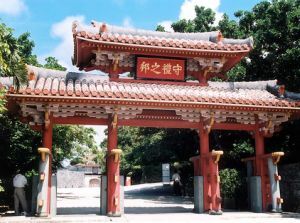 It was established in the early 19th century to provide a burial place for foreigners who died in the Ryukyu Island and was largely destroyed during the Battle of Okinawa in April 1945. 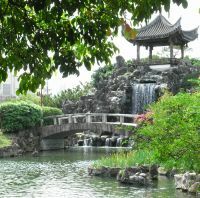 Re-established in 1955 it is now a tranquil enclave and also includes a memorial to Commodore Matthew Perry of the US Navy, responsible for the opening up of Japan to the west in 1854. At the present time it is still open for interments. The massive Peace Memorial Park is located near the southern tip of the island where some of the fiercest fighting took place and overlooks the sea. The Memorial Museum, gives a sobering overview of the road to the battle, the battle itself and the reconstruction of Okinawa. A series of huge stone tablets lists all those who fell in the battle including Americans, Britons, Koreans, Taiwanese, as well of course Japanese. It lists approaching a quarter of a million names. A few kilometres west of the Peace Park stands the Himeyuri Monument (Himeyuri no To) with an adjacent museum. It commemorates the fate of female high school students, who worked in army field hospitals in caves under horrendous conditions. Most of them did not survive the war. Another thought provoking, war related site is the Former Navy Underground Headquarters, several hundred metres of underground corridors and rooms, which served as the Japanese Navy's headquarters during the war. Many sailors committed suicide in these tunnels, after their situation had grown hopeless towards the end of the battle. Just outside Naha is the imposing Shuri Castle, a World Heritage site in a parkland setting and the location of the 2000 world leaders’ summit. Bill Clinton attended for the United States, Jacques Chirac represented France and Tony Blair for the United Kingdom. Dating back at least 1,000 years it was virtually destroyed in World War II, the reconstruction completed in 1992 based on photographs, historical records, and memory.